I found this ball of cotton acrylic blend yarn of beautiful teal color and I couldn't let it go. I held it in my hands and my mind was racing, thinking what I could do with it. I have meant to make a simple basket weeks ago and I think this yarn is perfect for it! 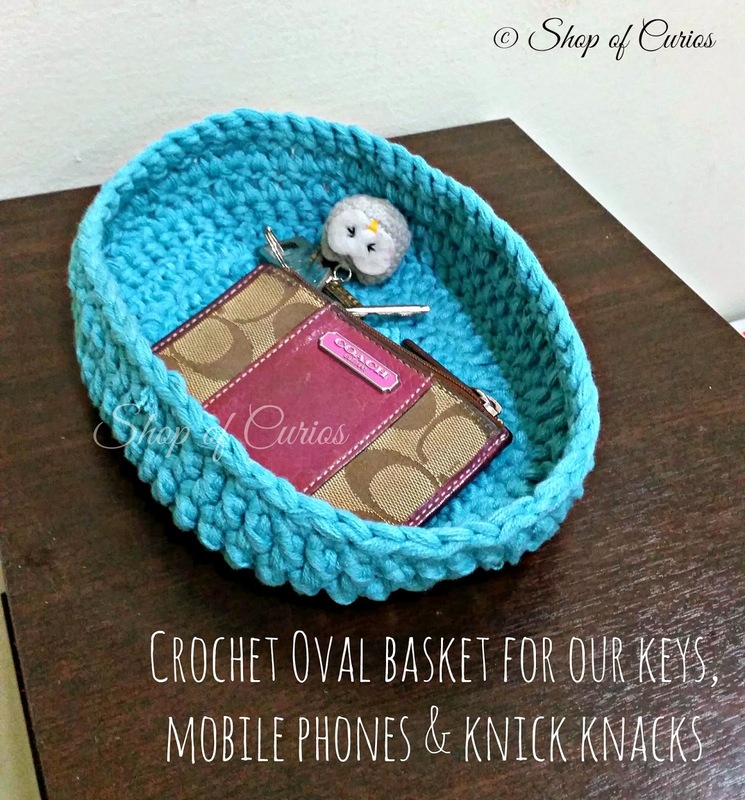 I wanted to try my hands in making oval shaped basket so I googled and found a very simple but detailed tutorial on making an oval shaped base over at Crochet Spot. I didn't have any idea how I am going to continue from the base since it was not covered in that instruction but I was too hyped up to sit down to google further. With my limited crochet knowledge plus a good one and a half hours later the oval basket is done I immediately fall in love with the vibrant color basket, feeling satisfied with my own creation I went around the house to find a good spot to place it. So here it is, sitting on top of our shoe rack by the door, now we do not need to throw our keys, mobile phones etc any where when we stepped into the house and having to spend some time looking for them later, they will be safely nesting in this basket waiting for us to grab them when we leave the house next. While keeping in my mind the instructions from Crochet Spot that "The increases are similar to that of circles, and the rectangle part is just like crocheting in even rows" I crocheted the 4th row for the base by increasing a double crochet for every double crochet in a double crochet. The increase should be correct and gives you a beautiful oval base (unless I miscalculate it some where, I will only know when I make my 2nd oval basket) but even if it does not it should not veer too far off and you should have a base that stays flat. - 6 dc into final ch. - Working into the other side of the ch, dc into next 4 dc, 3 dc into last ch. - ch 3, dc into same stitch as sl st, dc into next dc, (2 dc into next dc, dc into next dc) 2 times. - dc into next 4 dc, (2 dc into next dc, dc into next dc) 6 times. - ch 3, dc into same stitch as sl st, dc into next 2 dc, (2 dc into next dc, dc into next 2 dc) 2 times. - dc into next 4 dc, (2 dc into next dc, dc into next 2 dc) 6 times. 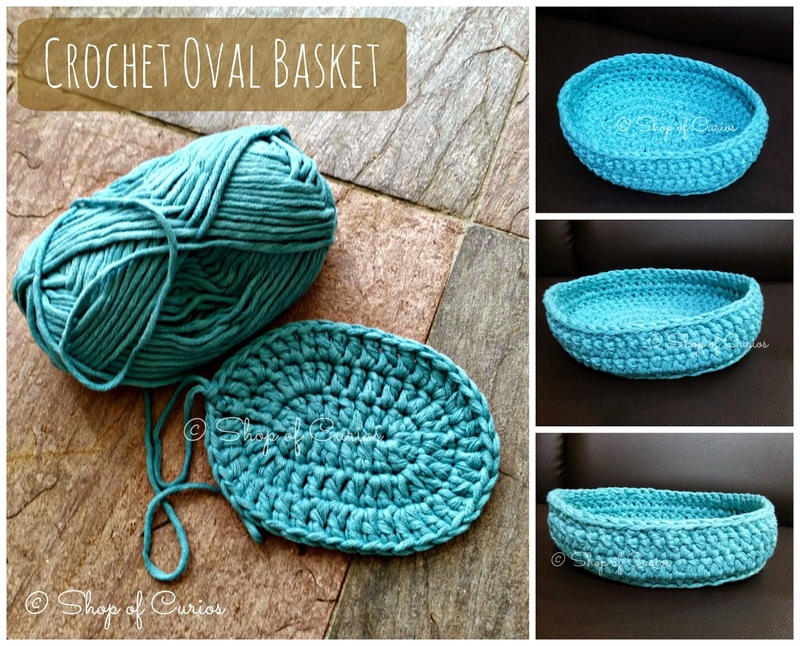 what size crochet hook did you use for this basket? Hi, it was 5mm hook.